Now...I know there are times when I need a quick card. Maybe one to say thank you...or maybe a "Just Because". I never seen to have too many of those lying around these days. So I set out to make a few over the weekend. The designs are simple, but I love the results. Sometimes simple makes a string statement all on its on. The flower wreath was created using "You Brighten My Day" stamp set, then embossed using silver and gold embossing powder. Here is the Purple and Silver card, to which I added purple pearls. Here is the lime and gold, to which I added gems. 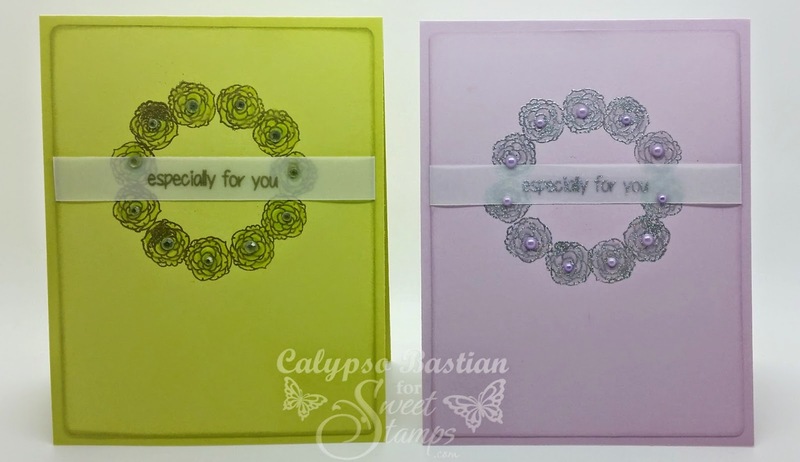 The center sentiment is from the "Simple Greetings" stamp set. well...I thought I found it but I didn't. Where exactly is the linky widget? I can't seem to locate it?